While many of us struggle with daily routines that include high-pressure goals, chasing deadlines, and rushing to beat the tyranny of the urgent, our best-laid plans ultimately collide with another world—eternity. Whether it’s through the death of a loved one, our own failing health, or another significant life event, we all come to moments when we’re forced to stop and consider eternity. 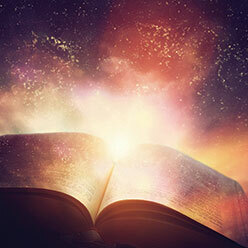 In his feature article this month, “Eternal Perspective,” Dr. Henry M. Morris III says, “If there is any hope of our gaining an eternal perspective during our short lives, it surely must begin, focus, and thrive on the ‘word of God which lives and abides forever’ (1 Peter 1:23).” Dr. Morris reminds us that we only have one very short life. As believers, this compels us to consider how He wants us to use the time we’re given. With an eternal perspective, we consider what matters most to God. He makes it clear that the souls of people are eternal and His Word stands forever. Our time and resources are best spent on what He says will last. The souls of people are eternal and His Word stands forever. At the Institute for Creation Research, our mission pursues both of these God-given priorities. We use scientific evidence to defend and confirm the absolute authority of the Bible, and we do this to strengthen the faith of believers and reach the souls of those blinded by evolutionary philosophy. We are increasingly concerned that the biblical creation message is being rejected by unbelievers and believers alike. Students are pressured to settle for questionable explanations that discredit what God says about our beginnings. This generation willingly accepts evolution as real science. Decades ago, ICR founder Dr. Henry M. Morris noticed this alarming movement of culture. In our new biography, Henry M. Morris: Father of Modern Creationism, Rebecca Morris Barber recounts his efforts to impact the world with creation truth from science and Scripture. His life story will encourage you—he surely lived with his sights set on eternity. Building on Dr. Morris’ legacy, we want to equip you with ready answers for your creation questions. In this issue, nuclear physicist Dr. Vernon Cupps points out that “the biblical narrative provides us with a different paradigm for the origin of the elements.” Geneticist Dr. Jeffrey Tomkins shows us how the human brain defies “any explanation that relies on chance.” Physicist Dr. Jake Hebert says, “The answer to the question of human origins is found not in evolutionists’ mental projections and ever-changing evolutionary story but in the divinely inspired Genesis history—the real story of mankind.” As demonstrated in these articles and thousands more on our website ICR.org, God’s inspired Word includes His historical record of how we all got here. The Bible is inspired from the first word to the last. Our founder said years ago, “If the Bible cannot be understood, it is useless as revelation. If it contains scientific fallacies, it could not have been given by inspiration.” The Bible is inspired from the first word to the last. Its truth feeds the human soul and shows us what really matters. So, how do we gain an eternal perspective of life? How do we move beyond the daily activities that distract us from the soul issues? Surrender your life to the One who made you—the Lord Jesus Christ. Trust Him with everything, including the truth about your origins. When you spend time with the Creator of the universe—simply talking to Him and reading His Word—He’ll show you how you can impact souls. You’ll recognize the needs of those around you and be better equipped to point them to the Lord. And as you search the Bible, the Creator’s personal message to us, He’ll give you new eyes to see His wonderful works in creation. Cite this article: Jayme Durant. 2017. Creation and an Eternal Perspective. Acts & Facts. 46 (9).